A large peasant farmer’s kitchen has been recreated on the ground floor of the villa. The room features an ample fireplace, a hearth replete with hemp shavings and the opening of a bread stove. The fireplace (caméṅ/fuga), usually situated in the center of one of the kitchen walls, was the most important element of the room, as it was the principal heat source for cooking and for heating the house during the cold season. Next to the fire pit there were usually one or two burners (furnèl), either stationary (built with brick) or mobile (made from stone, iron or cast iron), used for cooking food and heating liquids in small containers. The center of the room contains a large table around which family members would sit for meals. Additionally, this often extendible surface served as the area for food preparation, ironing (after having laid a cloth) and, in general, as a work surface for various activities. Tools used to make bread, pasta and polenta line the walls, together with those for handling pork and meat, preparing water and heating and lighting the home. The objects on display include a fly catcher (al ciapamòsch), positioned on the table. A small quantity of wine or vinegar was poured into this glass apparatus. Attracted by the liquid, flies entered through an opening at the base. After becoming dazed and confused by the potion, they remained trapped inside. 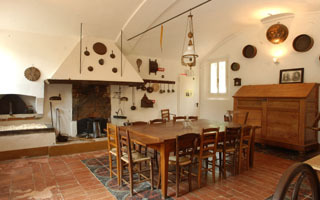 Hanging on the chain of the fireplace is a handmade copper pot (la caldarénna), used for preparing large quantities of food such as vegetable soup, pasta and polenta. Located nearby (or sometimes within the kitchen itself), a small nook that could also be used as a pantry was cordoned off by a curtain. This area often contained the water receptacle (al stièr), or sink, a rectangular tub of stone connected to the outdoors via a hole or tube. Residual water from washing vegetables and dishes was discarded here. A dish-drying rack usually stood adjacent to the sink. In homes without one of these nooks, dishes and vegetables were washed in a large tub resting on a table. The oven was usually found in a separate building outside the kitchen, together with the pigpen and henhouse. Before homes were connected to the public water main, water was collected from the well and kept indoors in two types of containers: a copper pail (calzaider) and a wooden tub (mastèla). The first, with its ladle, was hung from a hook on the wall and contained drinking water. The second, usually found on a table near the sink, held water for other uses. The kitchen was without a doubt the area where the bulk of domestic life was conducted: in addition to being the privileged sphere of the reggitrice, the woman who remained in the home to prepare meals,the kitchen was where the family assembled at breakfast, lunch and dinner and at other times of the day during the winter months to warm up. It was a center of intense socialization, where the generations mingled and knowledge was passed on. The centrality of the kitchen is reflected in local dialect. The term “ca”, meaning casa, or home, was used broadly to indicate a residence, but also more narrowly to refer to the place in which meals were prepared and consumed.